The princess of a subterranean community, cheerful and inquisitive Patema loves investigating the mazelike tunnels and caverns of her homeland ­ especially the forbidden ‘danger zone’. 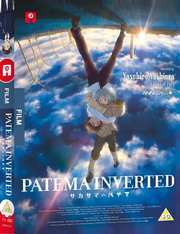 While out exploring, however, Patema falls headlong into an impossibly deep pit …only to find herself on the surface, mysteriously ‘falling’ upwards into the sky. Saved by a teen boy named Age, Patema discovers that on this strange surface world, the floor has become her ceiling. Not only that but Age's country is a harsh, propaganda­ridden tyranny where people are forbidden to look upwards. With all underground dwellers seen as unholy sinners, Patema soon finds herself pursued by the secret police. Together with her new friend, she must uncover the dark conspiracy that lurks behind their two inverted worlds ­and live to tell the tale!